Most days it is easy to feel invisible. And quite honestly this can be beneficial. As a shy introverted young girl, I often felt most comfortable when I was invisible. In a boisterous Italian family one may wonder how it was even possible to survive on the quieter side of the spectrum, but when you are surrounded by strong personalities you don’t need to compete. As the story goes, my two closest childhood friends will eagerly tell you that I found my voice towards the end of high school and the personality followed to reveal itself in the college years. Then there was all of the other life lessons of finding different voices as I took on other roles in my life…a business person, a wife, a parent, a passionate cook, and a blogger. Each role required a different voice, none of them stagnant. As each new milestone passes, I look to uncover that new voice that tells my story. The interesting thing is that in business we focus on the voice of different personas. As a consultant, I’ve often shared with clients that different voices should be used when addressing different audiences, and no where is this more true than in social media. For example, just because I love my kids (beyond measure) or enjoy food blogging, it would be ridiculous to only want to share my life from that perspective. Like you, I am multifaceted and dimensional. I want to walk into a party and be able to be versed enough to engage in different discussions with different people. I realized that those bloggers I connected with the most, were those that showed me glimpses into who they are and shared aspects of themselves. Case in point. What I love most about blogging is not only having the opportunity to develop recipes but to tell the story that leads me to you each time I write. I love when people will say to me, “I read your post and it made me think about something in my life”, or when they share how much they enjoy a recipe. I like to think of this space as food for the body and soul. Today I am feeding my soul as I remember Ginny. In her 104 years she undeniably left her imprint on me… and I miss her deeply. 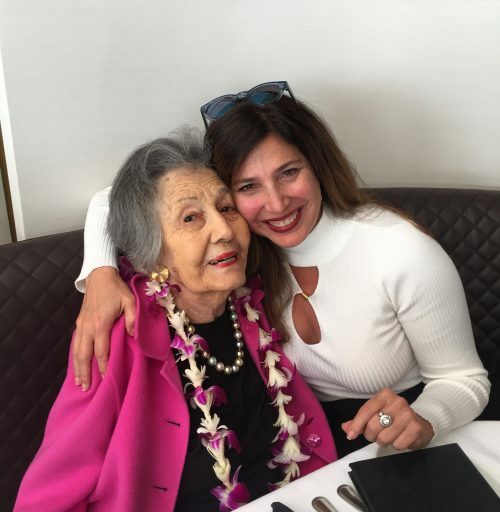 I don’t find myself reduced to tears, I know that it was time for her to leave this world, but I do find myself revisiting our conversations about life and food and love. She had a way of getting me to confess my soul. She was quick to understand the nuances of a conversation and had this insane way of making everyone she spoke to feel as if they were incredibly interesting and important. Even in her declining years she noticed the smallest of details. And it was this attention to detail that made her such a fabulous cook and baker. Sometimes I read over her recipes, meticulously typed up, with 3-5 revisions written by hand in the margins and I can hear her voice. These coveted documents read like a game day playbook. Regardless of the complexity of a recipe, it required her detailed focus. She wanted to ensure that anyone that she shared her recipes with could replicate her deliciousness, so she made sure to capture the subtlest of changes on her path perfecting each one. I can remember bouncing into her kitchen on the weekends to the wafting aroma of cinnamon baked apples. It was one of her signature weekend desserts. I would stand in front of the glass window to the double oven, feeling the heat radiating out, and peer in anticipating how good it would taste; wondering if I could convince her to allow me to eat one before dinner and then another one afterwards. And while the aroma was in itself like a gift, the texture was on par – the earthy crunchiness of the nuts, the soft squishy plumpness of the butter and sugar soaked raisins, and that hint of lemon to balance out the sweetness; the textures and flavors all work in harmony. Happy Mother’s Day Ginny. You. Are. Missed. Wash apples and from the top of the apple remove the core leaving a little of the core in tact at the bottom to keep the filling contained. Remove a circular strip of the apple peel around the top opening to the core. Place in retangular baking dish. In a bowl mix together, sugar, cinnamon, pecans and grated lemon peel if using. 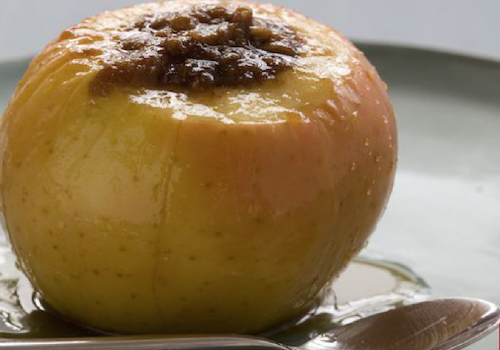 Fill centers of hollowed out apples with mixture and dot with butter and miniature marshmallows. Fill baking pan with ¾ cup boiling water, 2 TBS sugar in bottom of pan. 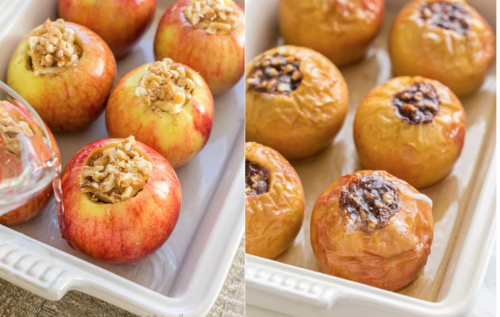 Cover apples with aluminum foil and bake 25 minutes or until tender. Do not over cook the apples or they will become mushy and similar to apple sauce. When removing from oven, baste several times with water mixture. Serve warm or at room temperature.